Hotel Theartemis Palace is located not far away from the sea and the 12 Km long sandy beach of Rethymnon. This charming and cozy hotel, with its antiques at the public areas, is just a few minutes walk from the town center and is surrounded with many shops and restaurants. 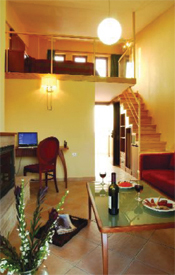 Heraklion airport is 85 Kilometers and Chania airport 60 Kilometers from the hotel. 243 rooms (175 Main building, 68 annex) plus 4 junior suites with Jacuzzi bath. All rooms are comfortably equipped with bath, hairdryer, balcony, a/c, heating, safe deposit box, direct-dial-phone, refrigerator and television/radio. Hotel Theartemis Palace meets all needs of a comfortable stay and provides except of a friendly reception service, room service, laundry service, restaurant with a rich buffet for breakfast and dinner with a great selection of Greek and International specialties, 1 bar, 2 snack-bars, TV-room, Jewellery shop, mini market, soft animation. Parking facilities. 24 hour reception (Exchange, excursions bookings to all parts of Crete and Santorini island, car and motorbike rental available. All credit cards accepted). -1 heated indoor/ outdoor with children section and hydro massage. Table tennis, darts, billiard. Sauna upon charge as well as a small fitness room free of charge available. 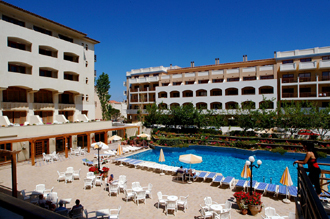 During high season the hotel is organizing theme evenings, piano music program and a Greek evening every two weeks. The hotel has 2 Conference rooms for max. 80 and max. 250 persons fully equipped with all facilities needed to make a conference or banquet successful. Taxi service and public bus to all directions.